Sensational menu tailored to seasonal, organic produce is the hallmark…. OIL PAINTINGS line the graceful rooms, white cloths and fresh flowers top the tables. Owner Paul Cocking greets guests, pours wine…And between a fine lineup of California wines and a nightly menu showcasing local specialty items, this is arguably the best dining in town. Read more…. Best Pasta in the Universe! Last week, three of us worked our way through a variety of appetizers and a few choice entrees that surprised, enchanted – just plain knocked us out. The best plate of pasta I’ve had outside of Italy was an orchestration of the housemade squid-ink fazzoletti – a silken, wide-body pappardelle – bathed in an inspired sauce of tomato, garlic, mint and Calabrian chili. The outstanding pasta was tossed with tender local calamari, fat nuggets of Dungeness crab and slices of scallop. It was so good I went back the next week and finished off another bowl. 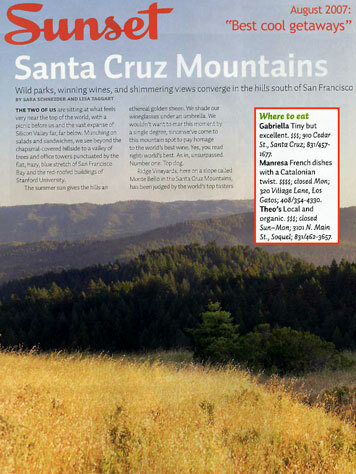 Sunset magazine chooses Gabriella one of three restaurants (along with Manresa and now-defunct Theo’s) to visit when touring the Santa Cruz Mountains. The food at Gabriella was always ultra-fresh, seasonal and local. Now it’s sophisticated as well. Not tricky. Not so conceptual that you have to sit back and have a Socratic dialogue every two seconds about the herbs, or the pedigree of the tomatoes. Let’s just say that [the chef] has eyes in the back of his head. If it’s just been picked, he’s on it. Impressive. Go to site. Gabriella Cafe has consistently high marks in Zagat, for three years running now. Gabriella Cafe is rated #1 for all Santa Cruz restaurants. White linen tables, fresh flowers, and comforting earth tones create a dining setting of complete calm. Simplicity never looked more romantic than at this small, unassuming restaurant. White linen tables, fresh flowers, and comforting earth tones create a dining setting of complete calm. The kitchen mirrors this feel by hatching a seasonally changing menu full of organic vegetables and local farm products. The smoked salmon fettuccini and the Guinea hen with tarragon sauce rate very high. All the desserts and pastries are homemade. The wine list is superb, and is offered by both the glass and the bottle.